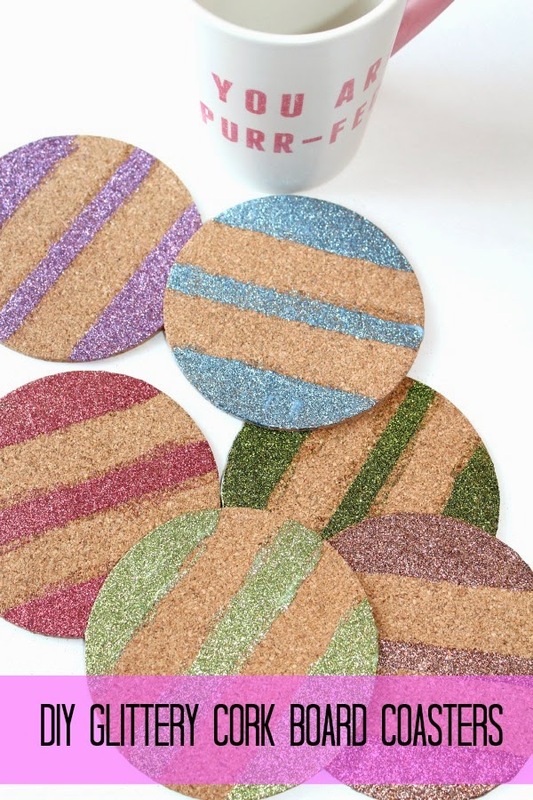 These glittery cork board coasters were so fun and easy to make. They take less than 30 minutes of your time to make (excluding drying time) and are so sparkly they will make you smile. 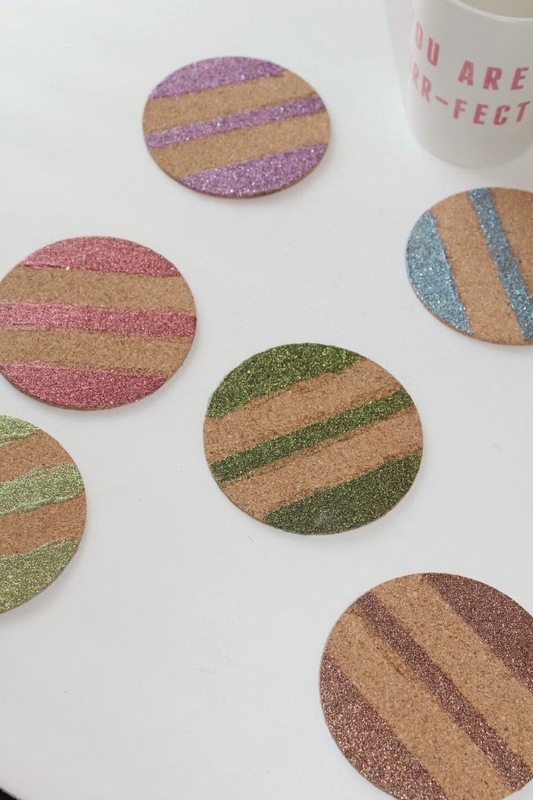 I love that these glittery cork board coasters are a useful item that you can always keep on display and were inexpensive to make. I also think a set of these wrapped up with a pretty ribbon would make a great gift. Now to the matter of the supplies you will need. 1. Put a piece of craft paper or a newspaper on the table you will be working at. 2. Place painter's tape in the pattern you like on each of your coasters. As you can see in some of the pictures below Jessica did a different pattern than me. 3. 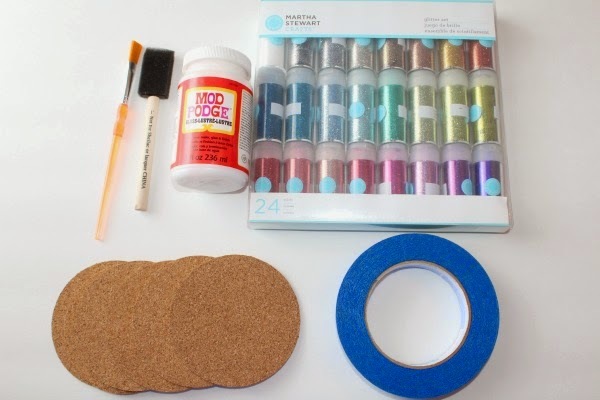 Doing one coaster at a time brush a thin, even coat of Modge Podge on the areas of your coaster you have marked off with the painter's tape. 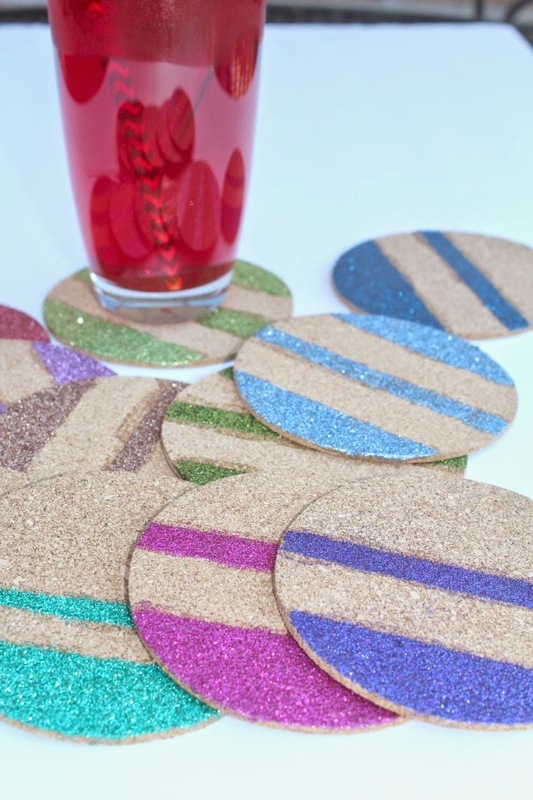 Immediately cover the coated areas of the coaster with glitter. Then remove the painter's tape (so the glitter on the coaster doesn't dry on it and pull off when you remove the tape later.) 4. Set aside to dry. 5. Complete this process with your remaining coasters. Then allow about 30 minutes to dry completely. 6. 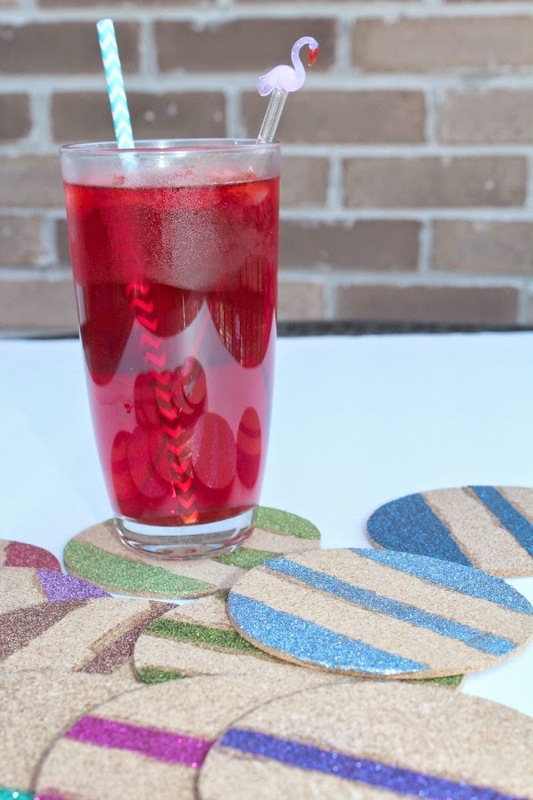 Shake off excess glitter and then cover the glittered portions of your coaster with Modge Podge and set aside to completely dry. 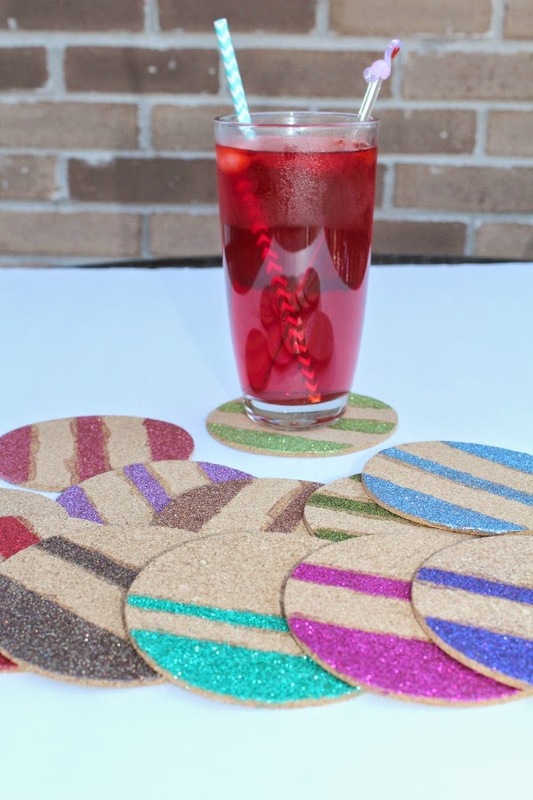 As you can see from all of the pictures I really love my coasters but for some more easy glittery crafts to make check out my DIY Glittery Stud Earrings and DIY Glitter Jewelry Dish. Wow, honey I love these little coasters! 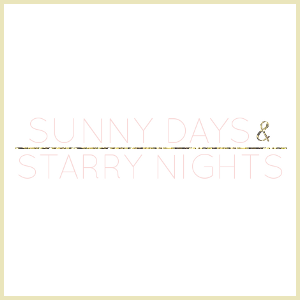 And I do love your blog, so beautiful DIYs!! Check out mine, I love to do DIYs too. Maybe we can follow each other? Would be sooo happy!! These coasters are SO CUTE! What a fun idea! They're so pretty! Love your DIY! super cute! i love these!! you had me at GLITTER! ooooh love it!! Great idea! So nice, love this easy DIY! Such a great idea. I love them, thanks for sharing! What a fun project, my niece would love these! It looks great! Cool idea! These are so cute, perfect for a summer party and so easy! What a great idea! So simple and super cute! What a great idea! So simple and super cute. I love this DIY how cute and a awesome idea. Such a great idea! 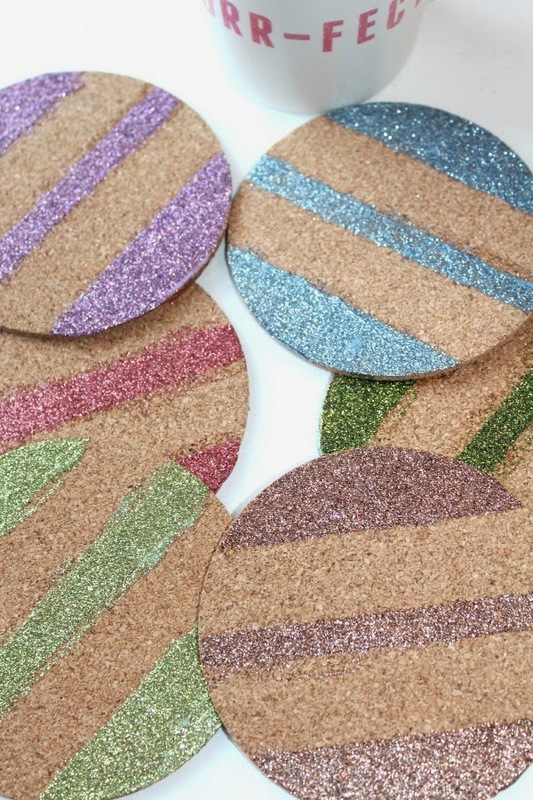 I love how you made plain cork board coasters so fun and glittery!